After graduating from high school with honors, Dr. Bell attended the University of Findlay and graduated with a degree in Pre-Veterinary Medicine. 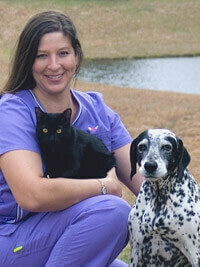 Since graduating from Kansas State University’s College of Veterinary Medicine in 1999, Dr. Bell has been a practicing veterinarian, devoting her time and attention to pets and their owners. In 2010, with her latest educational adventure, she earned an advanced degree in Certified Veterinary Acupuncture, and in 2011 received advanced training in Chinese Food Therapy. Dr. Bell enjoys spending her free time with her husband, Jeremiah, riding their two horses or being outdoors with her faithful dogs, Cinder and Jake. The newest addition to the group, a stray kitten (more like a Tasmanian Devil) named Toes, likes to keep things interesting.